Although when they tell us that there are bears in North America we imagine the famous grizzly, the truth is that it is not the one that lives in those latitudes. And is that the 'owner' of the region is the black bear. We tell you all about him in the following article. This carnivorous mammal is the most common mammal in North America and it can be found from Canada and Alaska to Mexico. He prefers forests and mountains, where to find good food and hide among caves and trees. As the name suggests, the black bear It has dark fur on most of the body, with the exception of the snout, which is brown or reddish. Some specimens may have brown, cinnamon or chocolate hair, especially those that live in the Western United States. We can find populations of up to 500 individuals in several national parks such as Yosemite, Yellowstone or the Great Smoky Mountains. Every year she sheds her hair and her thick skin protects it from insect bites. It can measure up to two meters long and weigh about 150 kilos on average, although females are smaller and thinner than males. His eyes are small and his vision is not very good, although he can distinguish colors, while both the sense of smell and the ear are quite developed. Its long snout allows it to get food among the trees, leaves and branches. 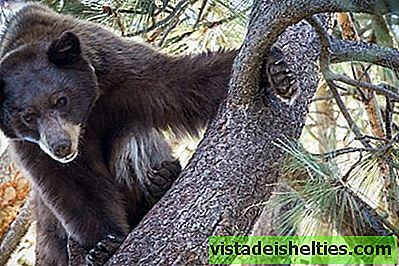 Unlike other bears, the American black does not hibernate in a 'strict' manner, but remains in a state of drowsiness throughout the winter, while living on the fats that have accumulated in autumn … You can eat up to 20,000 calories and several liters of water per day before hiding in your cave! When the cold months end, it heads towards the valleys and average altitudes to access the light and the heat of the sun. As the summer progresses, choose forests where you can protect yourself from high temperatures. As for its food, it is omnivorous, although Ingests mainly vegetables, berries, acorns, grasses, fruits and herbs. It also consumes ants, termites, bees or wasps, which it detects and catches with its long snout. He is a big fan of honey and during the summer he approaches the rivers to hunt salmon in full jump. This bear is a great swimmer and can climb the trees with impressive agility. In this way he escapes the dangers, mainly of hunting by man. In addition, it has the ability to walk on its two hind legs or sit on a rock, trunk or stone to rest. 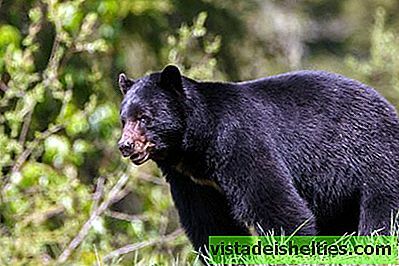 The black bear is lonely almost all year, except for sporadic encounters in areas with a lot of food, during the time of heat and reproduction, and when the mother takes care of the cubs (the male does not participate in this task). The mating takes place between May and June, and the pregnancy lasts about seven months, but does not begin right after copulation. The females perform a delayed implantation of the ovule so that births occur in the fall. Each litter is composed of one or two puppies, born without hair, blind and with about 350 grams of weight. The mother nurses them sitting for eight months and, from there, they leave the burrow to learn to hunt, get a good burrow and escape from predators (including the wolf, the puma and the brown bear). They abandon the mother one and a half years or once they have 'passed' all the maternal lessons, on which their survival will depend.